Our doors range from 5′ wide to 25′ wide (in 1 ft. increments). Standard heights are 7′ and 8′ tall. Odd-heights and odd-widths are also available and vary by individual door series. Many of our residential garage doors can be painted. Please see your owner’s manual for specific painting instructions. In addition, most of our commercial doors can be powder coated. We offer 197 powder coat colors to best complement the look of your home or your facility. R-Value is a measure of thermal efficiency, the higher the R-value the greater the insulating properties of the door. Overhead Door Corporation uses a calculated door section R-value for our insulated doors. We have several door styles to meet your insulated door needs for both residential and commercial applications. There are many factors that play into the price of a garage door such as: design, material, level of thermal efficiency, and geographic region. The great news is, according to Remodeling Magazine’s 2013 Cost vs. Value study, purchasing a new garage door is a great remodeling investment. To get a quote on a specific product, contact your local Overhead Door Distributor. Our garage door systems are built for long-lasting performance and daily use, but we recommend inspecting your garage door annually. If you suspect a problem, your local Overhead Door Distributor can conduct a thorough evaluation and perform routine maintenance. Read our blog article about garage door maintenance. Yes. A residential garage door requires a minimum of 7 1/2” of headroom space. Yes, your Overhead Door Distributor has insulation kits available to add insulation to your existing garage door. Although all garage doors require some level of maintenance, many of our doors offer a low maintenance solution without sacrificing design. The Modern Aluminum Collection features commercial-grade aluminum frames that are low maintenance and corrosion resistant. The Impression Collection® features a fiberglass exterior that captures the finest wood-grain texture with less maintenance than natural wood. The Courtyard Collection® features rust and corrosion resistant painted steel doors with woodgrain-textured trim boards that are treated to resist weather, fungal decay and termites. The Carriage House Collection features hot-dipped galvanized steel with two coats of baked-on polyester paint to reduce chipping. We make a door for every climate. Thermacore® doors ensure your maximum comfort whether it’s hot or cold. With R-values up to 17.5, this is our premium insulated door. 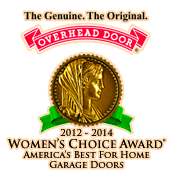 Courtyard Collection® doors give you the insulation of a Thermacore® door in a carriage-house design. Overhead Door offers a variety of heavy-duty, wind load doors built to withstand monsoon-force pressures. We customize our doors to meet or exceed any state or county wind load codes.